I have been a competitive (pool) swimmer for 24 years focusing on distance freestyle (400m, 800m, 50yds, 1000yds, 1650yds). I have on occasion swam other events, such as 200yd breaststroke, 400yd individual medley, to help out the team (and maybe slight lapse in judgment). I swam as a walk-on for three years at Stony Brook University and now swim when I can with the Cambridge Masters Swim Club at Harvard University. I started doing triathlons in 2009 because my then boyfriend was traveling for work for a month and I wanted to take on a hobby that took up a lot of time, so I didn’t go crazy with boredom or loneliness. I took a triathlon training class at the BSC (Boston Sports Club) and was hooked. My trainer was a long-time tri-athlete and coach and was a great mentor. I participated in my first tri 11 September, 2009 and have been hooked ever since. Competitive and ambitious by design, I will try any sport at least once; I even played a season of badminton in high school for a boy. 2016 Ashland triathlon (Olympic distance). This race was challenging in so many ways. 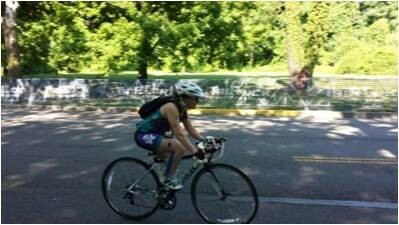 I had signed up for the Olympic distance Philly Tri-Rock as part of the 2016 Fit to Lead (HBA Greater Philly) challenge and wanted to get in an Olympic distance race beforehand as I hadn’t done an Olympic in almost two years. I had my son, Oliver, in 2014; adjustment was an understatement. My races became my trainings (FYI, I don’t recommend this). I also found I was so scattered, that I didn’t take the time to prep for my races. I had no experience with this course (Ashland) and basically raced blind. The distances were longer than any Olympic I had done in the past; 1 mile swim, 26.5 mile bike and 6.5 run. The course was really technical (so many hills). I was so defeated by the end, but still determined to finish, I pretty much cried the last 10 miles of the bike and about 2 miles of the run. But I finished, (dead last) and my son and husband cheered me into the finish chute and the race director saved me a plate of food and race swag. I never want to feel like that again going into a race or during. I’m lucky I haven’t been injured and I can still recover really well. This race was humbling and embarrassing. A less stubborn person probably would have said, “I’m not ready” and not gone to the starting line; I, however, woke up after almost five hours of being on the course, at the finish line, determined to do better in 2017. What have you chosen as your transformative event for Fit to Lead Boston? I have picked the ½ IronMan (FirmMan) on Narragansett Beach, in Rhode Island, 10 September, 2017. As noted previously, until very recently, both with swimming and triathlons, I had a rigorous training schedule. The challenge is to train smarter rather than longer. The race I picked will test this in a big way. I must train for this race. I shouldn’t have gone into the Ashland tri without training, I know this now. But having never done a ½ IronMan distance (70.3miles), I need to be much more prepared for this race than I have been approaching racing/training lately. Getting back to my roots and digging deep into my discipline from within and having the support of my family and the HBA Fit to Lead program, will get me there. Being an athlete my whole life, training and getting to the finish line is my comfort zone. The elation that I feel when I see the finish line, I have been trying to bring to my workplace self in a different way, because our work is never done. Being happy with milestone completions or parts of larger projects being completed or even getting to an action point after having a difficult conversation with a co-worker; smaller victories but still victories. Working in the pharmaceutical oncology industry as a strategic lead on a program has been out of my comfort zone. What I am taking away from my trainings and my previous athletic experiences? Resilience, teamwork, failure, set-back, preparation, accountability, focusing on what’s important, prioritization and smiling are all things that I am bringing to the office every day. I am a total Harry Potter geek.